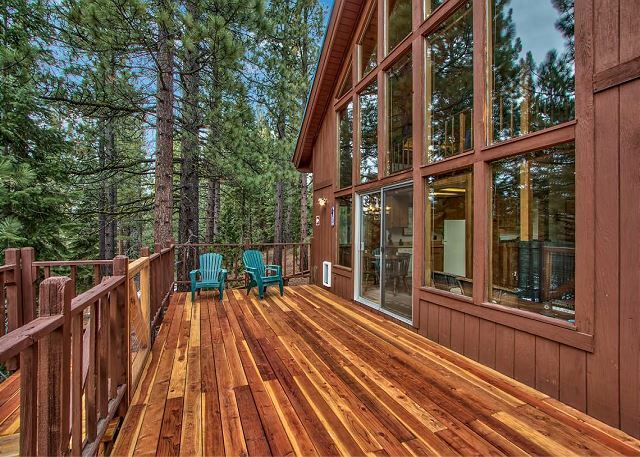 The Breen family Tahoe chalet is set in the most peaceful location, nestled among trees, surrounded by California conservancy lots and backing to the Tahoe Paradise Golf Course. 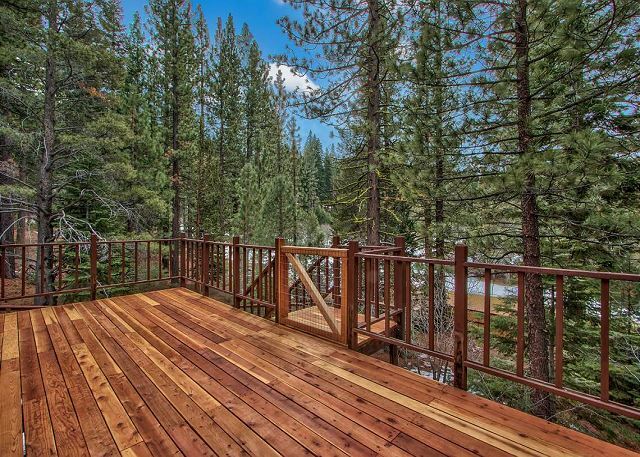 This cabin is perfect for the family looking to relax and enjoy nature and Lake Tahoe at its best. Located in peaceful Tahoe Paradise near outdoor recreation: Tahoe Paradise Golf Course, Lake Tahoe Golf Course, 25 minutes to Sierra At Tahoe or Heavenly Lake Tahoe. Guests park at the top of the lot and proceed down the walk way to the chalet. The first thing you see upon entering is a wall of windows looking out over the fantastic views. 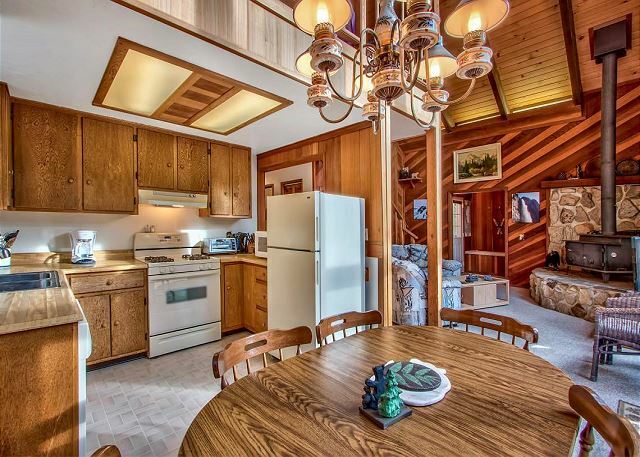 The open great room is accented by a high vaulted ceiling and a woodstove. Adjacent is the dining area and kitchen. The first floor features a full bath and two bedrooms. 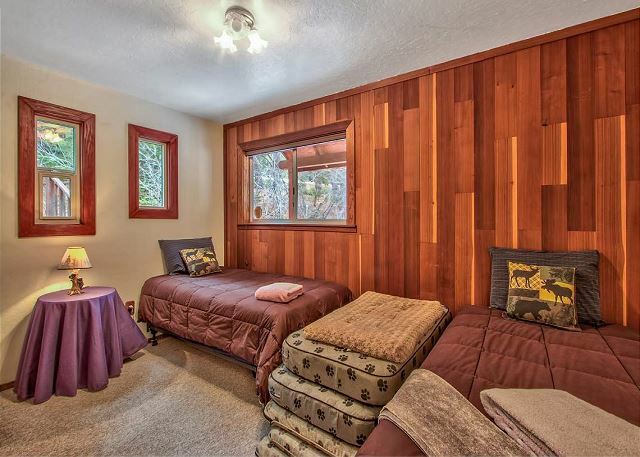 Bedroom one has a queen bed and bedroom two has two twin beds. The third bedroomupstairs has a queen bed and a full bath. 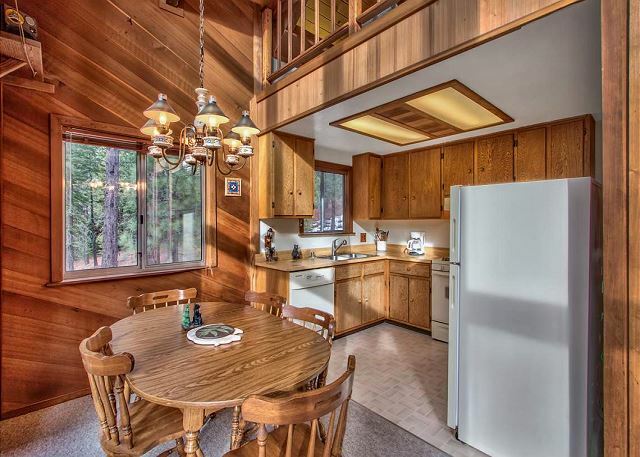 The kitchen has a gas stove, dishwasher, microwave, disposal, toaster oven and comes equipped with pots and pans, dishes and glassware, everything you need to feed the family. The garage is accessible for parking and there is additional off the street parking (cars are not allowed to park on the street during snow removal conditions). Wood is not provided for the woodstove but is available from many local retailers. Maximum Number of Vehicles: 4 must be parked in garage or driveway, no street parking allowed. Thank you for the notes, given the amount of snow we got this year it was a real struggle to keep up on all the storms. We appreciate your patience. a guest from Vallejo, CA does not recommend this vacation rental. Thank you-we hope you stay with us again! Dog guests are the best! Thank you! We are glad you enjoyed your visit to Tahoe. Thank you for the feedback, we will work on the cobwebs-but always a struggle with older cabins. We do agree the views are the best along with the peace and quiet. Thank you so much for the detailed comments, we will share all of this with the homeowner, we greatly appreciate the feedback. Thank you for the feedback. We hope you stay with Pinnacle Lake Tahoe Getaways again in the future. Thank you-we are glad you had a good stay, and we hope you visit with us again! Thank you so much for the feedback, it has been a busy season and the house is scheduled for a spring deep clean and kitchen pots and pans upgrade. a guest from Merced , CA does not recommend this vacation rental. I am so sorry, we have been working hard on this house and have hired a new cleaning crew. a guest from Valley Springs, CA does not recommend this vacation rental. Eddie S from Sylmar, CA does not recommend this vacation rental. Thank you so much for the kind notes, we are glad you had a good stay in Tahoe and we hope you come visit us again. Quiet secluded retreat if you don't mind the up keep. Thank you for the comments, keeping condiments in supply is tough but we will work on your remarks.